Could you have bacterial overgrowth in your small intestines? Turns out SIBO may very well be an issue for me. I’m currently undergoing testing for SIBO, parasites, Candida, and more with a functional medicine practitioner. I’ll be sure to share all that I learn at Hypothyroid Mom in the coming months. Have you ever stopped to think why hypothyroid symptoms are seemingly all over the place? Hair loss, dry skin, cold hands and feet (poor circulation), depression, fatigue, and the hallmark symptom, constipation, do not appear to be easily connected to the same system and yet, they are. I would add to this symptom list, indigestion. The symptoms of indigestion may present differently for each person. This may mean reflux or a feeling of food sitting in your stomach for prolonged periods or you might have a hard time digesting food period. You might see intact pieces of food in your stool or you may note that you have a hard time digesting fats. This is because thyroid hormone sets the metabolic rate for every cell in your body and this includes every step and stage of digestion. Every cell in your body has thyroid receptors that bind and take in the active thyroid hormone Free T3, and this includes the cells and processes that line the digestive tract. If you do not have adequate levels of Free T3, this will have a significant impact on digestion at every stage, placing you at an increased risk for reflux disease, decreased gastric emptying, dyspepsia (feeling of gas and fullness in your stomach), your parietal cells will not make enough stomach acid to aid in digestion (and clear microorganisms off the food that you eat), your pancreas will make less digestive enzymes, your gall bladder will produce less bile to emulsify fats, and your migrating motor complex, which sweeps your small intestines clear of debris in between meals, will be suppressed. Your colon motility will be sluggish as well, allowing matter to back up and your bowel movements will become less frequent and less complete. What is SIBO and what does it have to do with hypothyroidism? Altered gastric motility is seen in many functional gut disorders. Hypothyroidism leads to altered gastric motility. Altered motility can lead to small intestinal bacterial overgrowth (SIBO). SIBO occurs when there is an overgrowth of organisms in the small intestine brought about by a motility disorder. Symptoms of SIBO mirror those I listed above, yet they are often more advanced and quite debilitating. In addition to these, the most common symptom with SIBO is gas production in the small intestine. When dietary saccharides and fibers meet up with the overgrowth of organisms in the small intestine, the SIBO organisms consume and ferment on these as they pass by, and the result is often painful and debilitating gas, bloating and distention in an area that is not used to harboring this level of organisms. The small intestine is narrower than the large intestine. It is more sensitive to stretching (distention from gas) and there is nowhere for the gas to escape. Instead, gas sits, and sits and very slowly dissipates across the small intestine lining and slowly moves down the gastrointestinal tract. This increases pressure further down the small intestine and can also hold the ileocecal valve open. This valve resides between the small intestine and large intestine. If this is held open, organisms can migrate up from the large intestine and make SIBO worse. I am not suggesting that everyone who has hypothyroidism will get SIBO. Hypothyroidism is simply a risk factor leading to SIBO. Some studies show as many as 54% of people with hypothyroidism, also tested positive for SIBO. 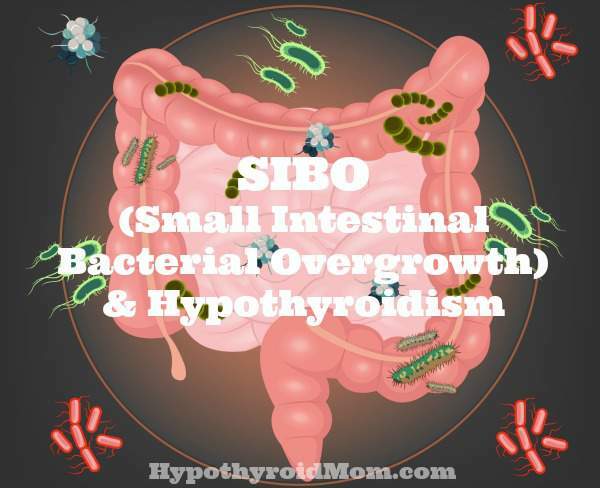 Once SIBO is present, it can be treated (knocked down with antibiotics, or herbal antibiotics), but thyroid function must be assessed and addressed because it primes the digestive tract for SIBO, making SIBO much more likely to reoccur. The body has several different ways it prevents SIBO from occurring. It produces stomach acid to clean organisms off the food that we eat. It signals the migrating motor complex to produce waves along the intestinal tract to keep matter moving forward and sweep debris clear in the small intestine and the ileocecal valve remains closed, opening only to allow forward moving matter to move from the small intestine into the large intestine. The small intestine also has a fairly quick transit time. Matter moves through the approximately twenty feet of small intestine in one to four hours. This quick movement does not provide a lingering food source for the organisms that reside along the small intestine. Organisms in the small intestine number in the hundreds to low millions, respectively, from the top to the bottom of the small intestine. Compare this to the large intestine, where the transit time along the five feet of large intestine is twenty-four to forty-eight hours and the resulting organisms which number in the many billions. With hypothyroidism, many of these protective mechanisms are inhibited. Additional risk factors to SIBO include the use of birth control pills, proton pump inhibitors, NSAIDS, narcotic pain medication, and stress. When assessing thyroid function, it isn’t enough to assess Thyroid Stimulating Hormone TSH. If TSH is well within range and Free T3 is too low, this is still a hypothyroid state. Thyroid Stimulating Hormone TSH (1.8-3.0 µIU/mL), Total T4 (6-12 µg/dL), Total T3 (100-180 ng/dL), Free T4 (1.0-1.5 ng/dL), and Free T3 (3.0-4.0 pg/mL). Ideally Total T4 should be around 10. Bound T4 is converted to T3 mainly in the liver and gut. The pituitary gland produces TSH in response to feedback mechanism from the body and brain. If Free T3 goes down, TSH should go up. TSH stimulates the thyroid gland to produce mainly T4 and a little T3. Once these hormones leave the thyroid they are immediately bound to proteins called Thyroid Binding Globulins TBG. Over 99% of circulating hormones are bound in the body. That’s because a free hormone is an active hormone. The body regulates free hormones tightly. If T3 Uptake is elevated, this correlates with a lower level of TBG. Look for elevated testosterone levels. For women, assess bioidenticals or PCOS (insulin resistance – causes insulin surges) or hypoglycemia (also causes insulin surges). For men, this may mean assessing steroids/ bioidenticals. If T3 Uptake is depressed, this correlates with a higher level of TBG. Look for elevated estrogen levels. Assess for estrogen dominance and birth control pills (if both, the issue is amplified). Oral estrogen interferes with the breakdown of TBG, so there is more binding capacity in circulation, which leads to more hormone being bound and less T4 to convert to T3 in the liver and in the gut. Reverse T3 (also seen as rT3 on labs) should also be assessed (9.2-24.1 ng/dL). At times of stress, the body will shunt hormone into rT3 instead of T3. The body cannot use rT3. One additional item to note here is how SIBO affects transit time. Some people experience chronic loose stool with SIBO. This does not mean that they have good motility or too much motility. This means that they are experiencing an osmotic shift, which draws water into their small intestine, flooding it with water that is then dumped into the bowel, triggering a loose stool event. When SIBO is present, thyroid function should always be assessed, regardless of the observed frequency of bowel movements. SIBO is a secondary condition. It is present because something else caused it. To be successful at treating SIBO and truly succeeding at curing SIBO, the underlying factors, conditions and motility dysfunction, including thyroid function, must be fully assessed and addressed. Angela Pifer has a thriving private practice Nutrition Northwest for the past 11 years, working clinically as a licensed Certified Nutritionist, with offices in Seattle, Kirkland and Woodinville. She was trained in Functional Medicine, even before the term ‘functional medicine’ became a buzz word. She specializes in functional gut disorders and for the past 4 years her practice has focused solely on SIBO. As the SIBO Guru, instead of chasing symptoms, she helps her patients get to the root of their illness. Anant D. Patil. Link between hypothyroidism and small intestinal bacterial overgrowth. Indian J Endocrinol Metab. 2014 May-Jun; 18(3): 307–309. Shafer RB, Prentiss RA, Bond JH. Gastrointestinal transit in thyroid disease. Gastroenterology. 1984 May;86(5 Pt 1):852-5. Ebert EC The thyroid and the gut. J Clin Gastroenterol. 2010 Jul;44(6):402-6. Gunsar F1, Yilmaz S, Bor S, Kumanlioğlu K, Cetinkalp S, Kabalak T, Ozutemiz OA. Effect of hypo- and hyperthyroidism on gastric myoelectrical activity. Dig Dis Sci. 2003 Apr;48(4):706-12. This is good to know. I have all the systoms of SIBO. I am not sure my Endo will check this out for me. I know my thyroid are off. I have severe gut issues. What is a herbal antibiotic?